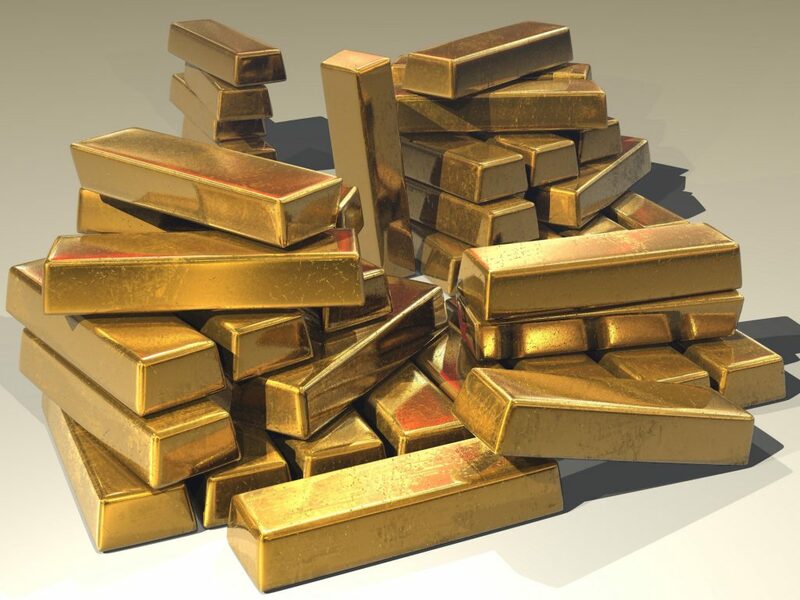 Since the beginning of the mining of gold, it has been used as currency to create highly valuable coins. 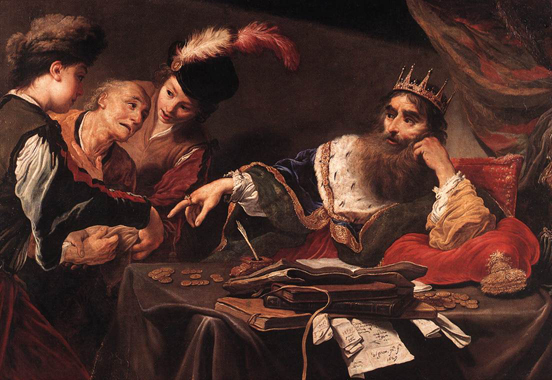 King Croesus had created the first gold coins (painting by Claude Vignon, 1629). Gold has been used to make coins for centuries. The first high-quality gold coins were minted by King Croesus, who is immortalized in our expression “as rich as Croesus.” Croesus’ Lydian kingdom was a thriving center of trade in the 6th century B.C. and his gold coins, called staters, became a mainstay of commercial exchange due to their uniform weight, size, and purity. The enterprising Lydians are also credited with inventing the touchstone method for testing the purity of gold. In order to verify the gold content of coins or other items, Lydian merchants were known to rub the gold object on a black stone and compare the streak to marks made with needles containing known proportions of gold and other metals. The solid gold Greco-Bactrian stater coin, featuring the likeness of King Eucratides. The world’s largest stone of antiquity was issued by the Greco-Bactrian Kingdom during the reign of King Eucratides between 170 and 145 B.C. Only one example of this 20 stater coin is known to exist. 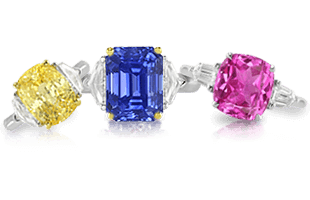 It is composed entirely of gold and weighs over 169 grams, measuring close to 58 millimeters in diameter. Today it is considered one of the most famous of ancient coins. The Romans had an insatiable appetite for gold. They routinely debased their currency because their need for coinage exceeded their supply of precious metals. In an effort to shore up flagging faith in continually debased Roman currency, Constantine issued a nearly pure gold coin called the solidus, which later became known as the bezant. A Venetian ducat from 1384-1400. The bezant proved to be exceptionally stable over time. It has been called the dollar of the Middle Ages; it remained in production for over 700 years, long after the fall of the Roman Empire. Gold coins were also minted by medieval Italian city-states. One of the best known is the Venetian ducat. The Spanish doubloon was used from the 15th to the 19th centuries and was minted in Spain, Mexico, and Peru from gold mined in the Americas. 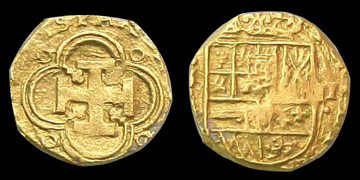 An escudos gold coin from the wreck of the Atocha. During the 16th and 17th centuries, large quantities of silver and gold were shipped from the New World to Europe in armed convoys of sixty to one hundred ships. Dutch, British, and French privateers constantly harassed the Spanish flotas. Although more losses occurred from violent storms at sea than from pirates and brigands, the danger of attack was considered a serious threat. A gold coin minted during the American gold rush. During the California Gold Rush, private firms, banks, and assay offices minted their own gold coins. It was simply more expedient to mint coins locally, as opposed to waiting for new issue from the official U.S. Mint. Unofficial coins were accepted everywhere and today, they are greatly prized by collectors. By the 19th century, the world’s esteem for gold was so great that it lead to the decline in the prestige of silver and its abandonment as a monetary standard. It would require another century for the world’s currencies to be completely separated from the international gold standard established in the 1870s. After World War I, when paper currency was losing its value due to rampant inflation, most countries stopped minting gold coins in order to conserve their reserves. Although most gold coins were initially intended as legal tender, today, gold coins fall into two major categories, collector's coins and bullion coins , although there is some overlap between the two. The 1933 double eagle coin, the most expensive coin in the world. Collector’s coins are coins whose value is determined by many factors including age, rarity, condition, and the number originally minted. In 2002, a 1933 U.S. Double Eagle twenty-dollar gold coin fetched over $7.5 million dollars, making it the most valuable coin ever sold. 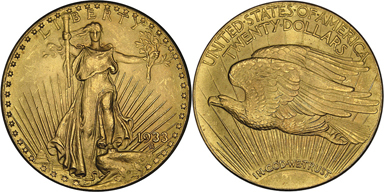 Although about half a million Double Eagle coins had been struck by the U.S. Mint in 1933, most of these were surrendered and melted into gold bars following President Franklin D. Roosevelt’s Executive Order 6102, which was issued to prevent U.S. citizens from exchanging their paper money for gold during the Great Depression. Since the Order made it illegal for U.S. citizens to “hoard” gold, few coins managed to survive the recall. Experts estimate that only about one percent of all pre-1933 U.S. gold coins escaped the meltdown, which explains why they are prized by coin collectors and investors. 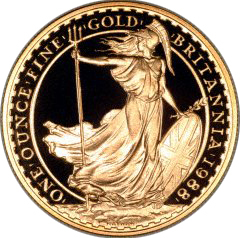 The reverse of a 1988 gold Britannia coin. Some bullion coins, such as the American Eagle and the Britannia, are issued in special “proof” editions, which are sold to collectors at high premiums. Proof coins are struck two or more times with finely etched dies so that every detail is enhanced. 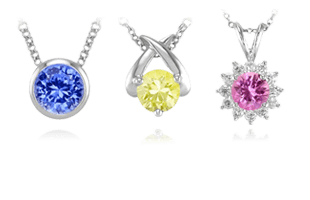 Because they are beautiful, many proof coins are incorporated into jewelry. More recently, an unknown number of 2007 George Washington dollar coins went into circulation without their edge inscription, “In God We Trust.” No one knows how many of the coins were released without the inscription, but estimates hover around 50,000. The sale price on eBay peaked at $600, before dropping to about $50 apiece when the public realized how many were in circulation. A coin from 113-112 B.C. 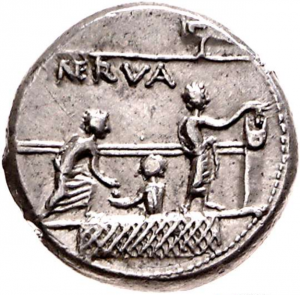 depicting a voting scene in the Roman Republic. Commemorative coins are coins that are struck in honor of important events, people, or places. Commemorative coins may be issued as regular coinage, as circulating coinage with limited term production, and as non-circulating legal tender, which are collector’s items or souvenirs. 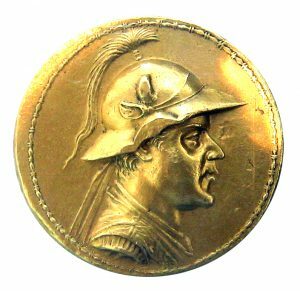 This is a longstanding practice; the Greeks and Romans were known to produce gold commemorative coins to celebrate victories on the battlefield as well as elections that enacted their laws. 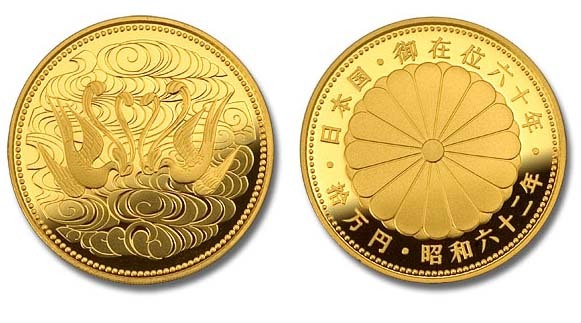 Emperor Hirohito’s 60th Anniversary 100,000 Yen Gold Coin. 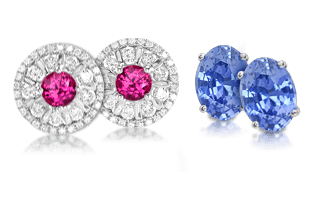 Bullion coins, coins whose worth is based on the value of their troy weight and the market price of the metal they contain, are popular with people who desire an investment. South Africa started a trend when it launched its one-ounce bullion coin, the Krugerrand in 1967. It was sold to large distributors at premium of three percent. The Krugerrand was the first gold coin to contain precisely one ounce of fine gold. Because the coins had legal tender status, they could be purchased by U.S. citizens who at that time were prohibited private ownership of bullion but allowed ownership of foreign coins. The next bullion coin issued was the Canadian Maple Leaf in 1979. 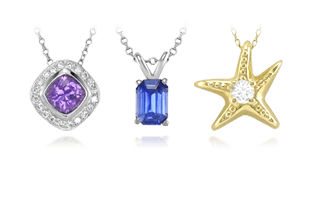 Since then, several others have been produced. Bullion coins are also produced in fractions of an ounce – typically half ounce, quarter ounce, and one-tenth ounce. Purity levels vary from .9999 to .9167. 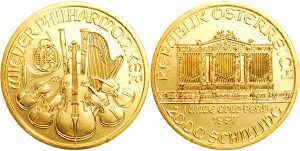 Worldwide, the best selling bullion coin is the 24K Austrian Philharmonic. First introduced in 1989, the coins are minted based on demand, so the amount produced varies from year to year. 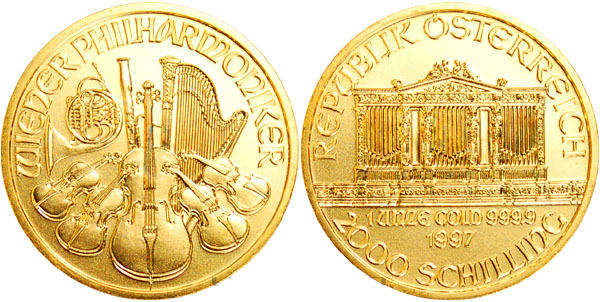 The design of the coin remains the same, featuring the pipe organ in the Golden Hall on the obverse, the reverse depicting instruments of the Vienna Philharmonic. Next, learn about the many uses of Gold in Industry | The Application of Gold.